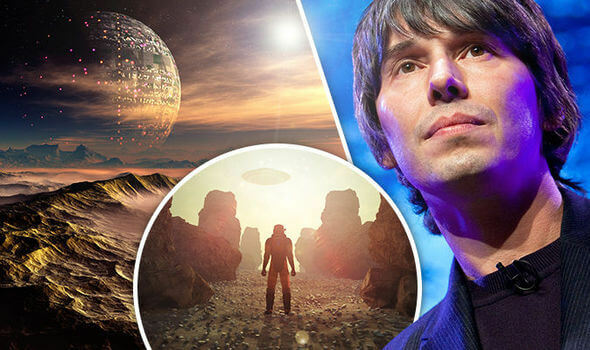 BRIAN Cox has claimed aliens have not made contact with us because the most advanced civilizations kill themselves off – and we will too. The star of TV’s Wonders of the Universe believes eventually every civilization kills themselves off, which is why no beings are yet to make a dominant impact on the universe. Professor Cox was basing his argument around the Fermi Paradox which questions why humans are yet to make contact with aliens. In 1950, physicist Enrico Fermi – the creator of the world’s first nuclear reactor – came up with a paradox which says due to the age and size of the universe there is bound to be a civilization much more advanced than ours, but why haven’t they contacted us? The solution, many scientists argue, is once a civilization reaches a certain size, it eventually kills itself off, either through war with advanced weapons or natural disaster. Steampunk fantasy floating islands and spacecrafts. The former keyboard player for the 90’s band D:Ream then warned: “We could be approaching that position.”However, other scientists disagree with the Fermi Paradox and believe that Earth was the first planet in the entire universe to host complex life, according to a recent study. The universe has been around for roughly 13.8 billion years and modern-day humans have existed for 200,000 years – just 0.00145 per cent of all time. While this may lead some to the conclusion we were late to the party, a group of esteemed researchers claim we could actually be well ahead of the curve and that advanced civilisations may not emerge for another trillion years. Avi Loeb of the Harvard-Smithsonian Center for Astrophysics and lead author, said: “If you ask, ‘When is life most likely to emerge?’ you might naively say, ‘Now’. The research says that any form of life became possible around 30 million years after the Big Bang, and scientists predict existence will continue to thrive for another 10 trillion years until all the stars in the Universe have extinguished. Loeb and the team calculated when life is likely to evolve between those two markers and found that the lifespan and size of stars is the most significant factor. Anything bigger than our sun would be too hot to support life, and anything younger would be too small.